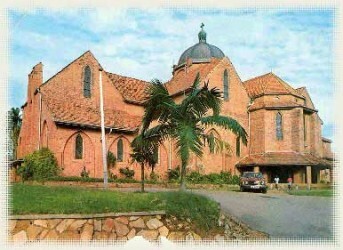 Namirembe is located on the hill of Namirembe, one of the seven hills of Kampala City. Namirembe in English means peace. Sunday, July16th was a day of homecoming because on this hill, I began my music lessons. I was happy to find the jack fruits and mangos trees which I ate for lunch during practice time. The soccer fields where we used to play every evening also still existed. The choir has performed in Nairobi and Mombasa Kenya, and Dar-es-Salaam, Tanzania. Among the gifted musicians from Namirembe are Mr. Samuel Kimuli (Fellow of the Royal College of Organists) and Mr. Michael Mukiibi who studied organ in France. Both of these individuals are currently based in England as music directors in churches. While still in Uganda, they inspired me to learn organ and music in general. On the morning of July 16th, I attended the 10: 00 AM Luganda service in which John Ssekibaala conducted the choir and Paul Lugya played the organ. The choir of thirty-five boys and men performed the Anglican mass singing psalms, responses and hymns to perfection! I videotaped this service for presentation to St. Thomas Choir on 5th Avenue in New York City. Dr. Gerre Hancock, the Director of music at St. Thomas Church in New York City, is interested in establishing a link between the Namirembe Cathedral Choir and St. Thomas Choir by periodically having a student from Namirembe trained at St. Thomas Choir School. He gave me a video of St. Thomas Choir which I presented to Namirembe Cathedral Choir. The boys at Namirembe were happy to observe how music at St. Thomas choir school is taught.